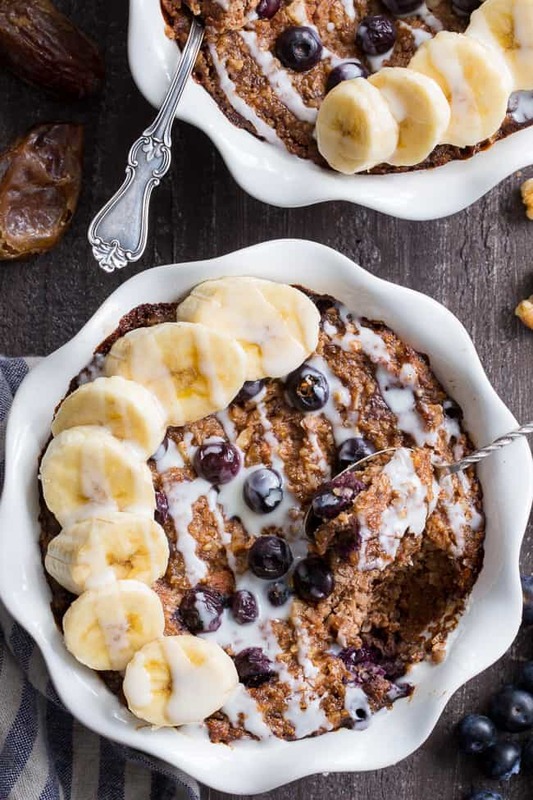 This Blueberry “Oatmeal” Breakfast Bake has a flavor and texture reminiscent of baked oatmeal, yet it’s grain free and paleo! It’s a perfect option for breakfast when you want something naturally sweet but want to keep things clean. It’s also egg free, vegan and contains no added sugar. I’m always at a loss for what to call these types of breakfast recipes! Sure, they’re reminiscent of oatmeal, but, you know I can’t actually call them oatmeal since there’s not a drop of oats (or any grain) in them. For those of you who are newer to my site, I have an apple cinnamon hot “cereal” that started this whole “oatmeal” thing for me. I could honestly eat a hash with a fried egg every single day for the rest of my life – no joke. However, many of you – my own husband included – prefer a sweeter breakfast that isn’t SO sweet, like cookies or muffins. There must be another alternative for those of us who don’t want sweet potatoes and eggs every morning! 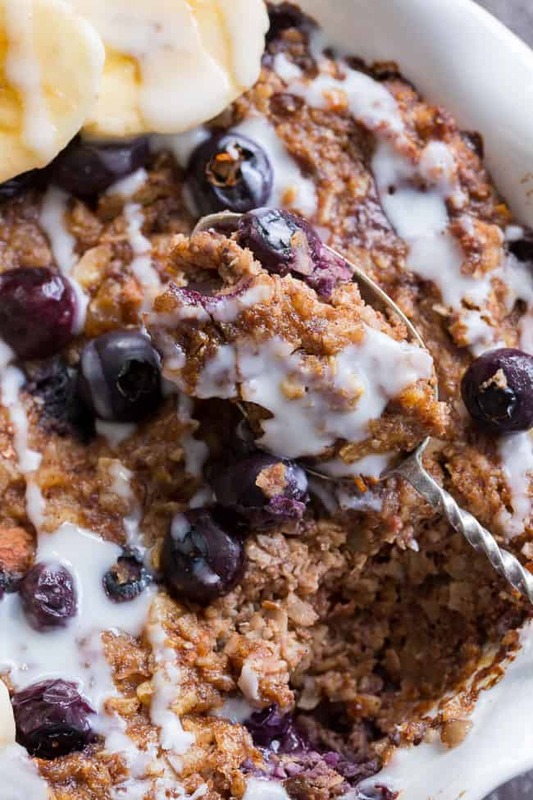 So, here we are – with another egg free, paleo, and sugar free breakfast bake that’s on the sweet side, but not too sweet, and even vegan, too. My husband (Adam, by the way, I’m not sure when I stopped using his name!) loves it when I make this recipe and my apple cinnamon breakfast bake, and I’m not sure he even knows he’s not eating actual oatmeal. This is one of those breakfasts you can make at the beginning of the week and it reheats perfectly each morning. Trust me – I tested this one twice and both passed the leftovers test. You can almost think of it as a coconut/nut/fruit breakfast casserole – because that’s basically all that’s in it! I love when simple ingredients come together to make something extra special! For toppings – the sky’s the limit – just like with traditional oatmeal. I’m a big coconut butter fan, so I love drizzling that over the top with some sliced bananas. Nut butter would be so yummy too! Also, I kept this recipe completely free of added sugar – sweetening it just with dates – but if you want a bit of extra sweetness, a drizzle of maple syrup or a dusting of coconut sugar would be really delicious. I hope you’re ready for breakfast! This paleo “oatmeal” is about to happen – I hope you enjoy – let’s go! 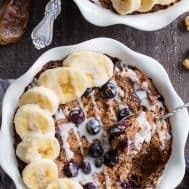 This Blueberry "Oatmeal" Breakfast Bake has a flavor and texture reminiscent of baked oatmeal, yet it's grain free and paleo! It's a perfect option for breakfast when you want something naturally sweet but want to keep things clean. It's also egg free, vegan and contains no added sugar. Preheat your oven to 375 degrees and lightly grease a 8” casserole dish, cake pan, or two smaller baking dishes with coconut oil. Place nuts, coconut and dates in a blender or food processor and pulse until a crumble forms - don’t blend too long or the mixture will become pasty. Stir in the almond milk, cinnamon, vanilla, coconut oil, lemon juice, salt and flaxseed/water mixture (the flax “eggs”) until well combined. 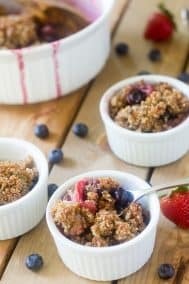 Fold in 1/2 cup of the blueberries, then transfer mixture to prepared baking dish(es) and sprinkle remaining blueberries on top. Bake in the preheated oven for 30-40 mins depending on size of baking dishes. To serve, drizzle with melted coconut butter, nut butter and top with sliced bananas. Enjoy! *Make ahead options: You can prepare and bake the night before, or prep the night before, store covered in the refrigerator and bake in the morning. 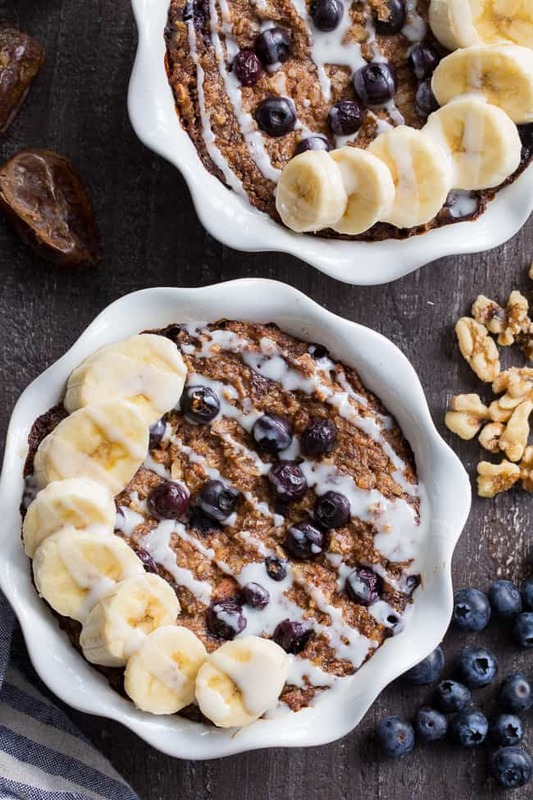 Want More Paleo and Vegan Breakfast Ideas? Try One of These! 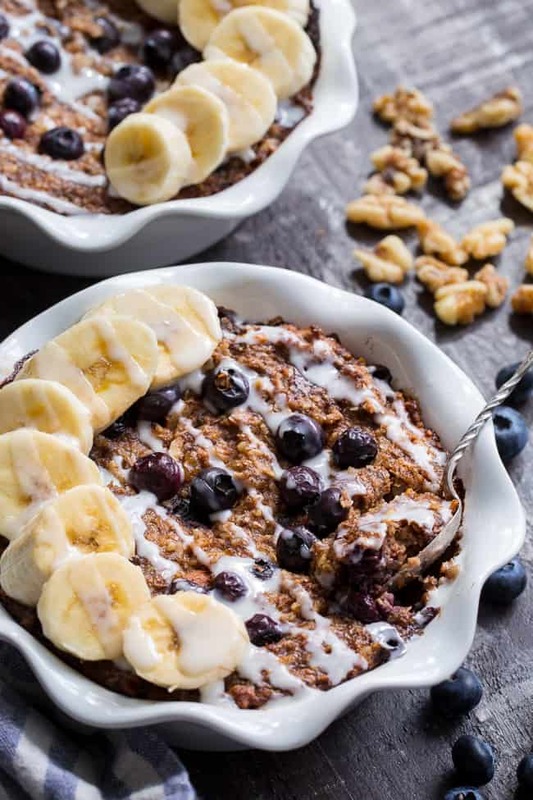 This oatmeal looks absolutely delicious and will make such a great healthy breakfast! Thanks for a great recipe! Looks amazing! Is there anything else I could use for the coconut flakes? 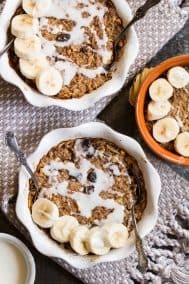 I don’t eat most nuts, so If I wanted to use gluten free oats in this recipe, would I substitute the nuts with the same amount of oats? Thanks! This recipe looks amazing!! It looks Whole30 complaint, but I noticed you didn’t label it as such. Is it compliant? If not, what adjustments could be made to make it compliant? Could I use eggs instead of the “flax eggs”? If so, how many would I use? Thank you! The vanilla likely isn’t compliant as most contain alcohol. You could probably just omit it or use vanilla bean part. I was wondering the same thing- if I could use eggs instead of the flax mixture? And how many? Thanks. This looks delicious! 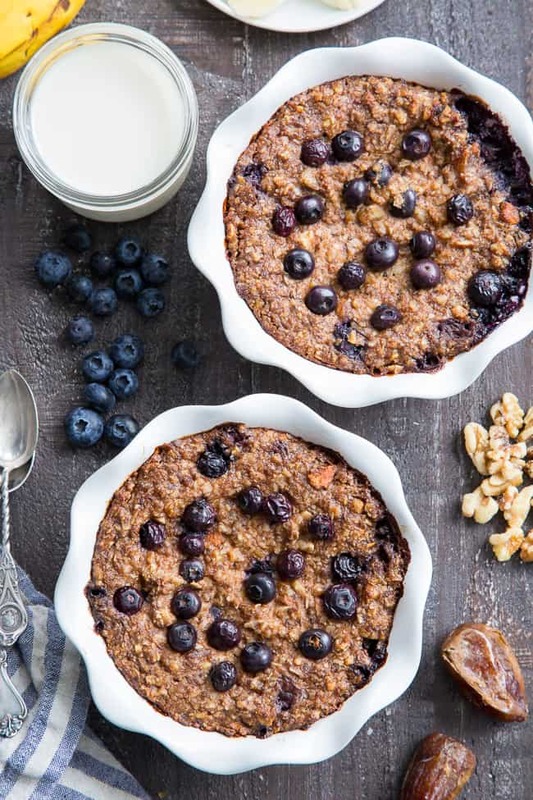 This is exactly the kind of breakfast I love – on the sweet side but healthy. Could I use frozen berries here ? Looks delicious ? Just tried this out for the first time and loved it! I put some Mara Natha Raw Maple Almond Butter as a topping with the nanners and it was amazing! Will definitely add it to my rotation for special craving occasions. Can I use frozen blueberries instead? I think they might make the texture too mushy, not sure! Made it this morning and I love it. Super easy to make, really filling and tasty. Thank you! Would this get weird reheated in the microwave? This is delicious! Reheats perfectly in the microwave. I used pecans and walnuts. I didn’t have dates so I used prunes. Topped with banana and almond butter. So good and filling! Oh I’m so thrilled to hear that! This is delicious! Both my husband and I love it! Does the nutrition info include almond butter and banana or is it just for 1/8th of the “oatmeal” bake? I made this yesterday, and it is super yummy! I used roasted, salted almonds for the nuts. I re-heated a bowl in the microwave this morning, and was just as delicious as yesterday. Thanks for the recipe! I love this recipe! My daughter is allergic to eggs, so I’m always on the hunt for a healthy egg free breakfast… I added a little stevia as this was for my children and a scoop of collagen powder for extra protein. It’s a hit! Made this last night and warmed it this morning! Absolutely love it! Does it need to be refrigerated for the next few days or can I leave it covered on my stove? I would definitely refrigerate and reheat as needed. Happy you’re enjoying it! Can you use real eggs instead of flax eggs and if yes how many? 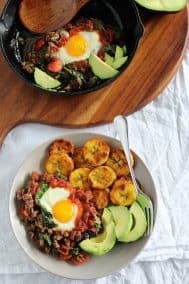 I used a lot of your recipes as my husband and I completed our Whole 30 🙂 We are looking to reduce our meat consumption now and was excited to find this recipe. Do you ever soak the nuts? Thanks.